The Atlas is a passive backplane that all other modules plug into. 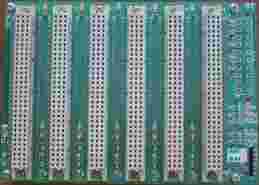 The circuit board has provision for up to six DIN41612 connectors at 0.8 inch spacing. An ATX 20 pin power connector is fitted to the board so that 12v, 5v, 3.3v etc. supplies from a standard PC power supply can be used to power the HPSDR. Since such power supplies are in plentiful supply, both new and surplus, this neatly solves the power supply requirements. The DIN connector spacing and board size have been chosen such that the backplane can be fitted into a standard PC enclosure. TAPR is providing a kit of the parts needed to complete the backplane. The following does not include the PCB! The following does include the PCB!